The globular cluster Messier 107, also known as NGC 6171, is located about 21 000 light-years away in the constellation of Ophiuchus. This image was captured by the MPG/ESO 2.2-meter telescope at La Silla Observatory in Chile. 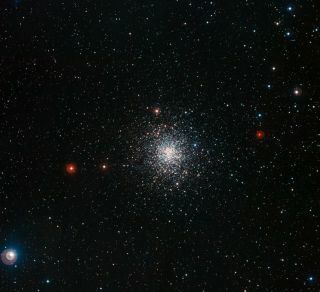 A stunning new photo shows a swarm ofancient stars in aglobular cluster. The image could help scientists unravel thecomplicatedhistory of the Milky Way. This cluster is an ancient family ofstars about 21,000light-years away. There, thousands of stars are concentrated into aspace onlyabout 20 times as wide as the distance between our sun and its neareststellarneighbor, Alpha Centauri. A significant number of these starshave already evolvedinto red giants, one of the last stages of a star?s life, and have ayellowishcolor in this image. Because globular clusters form duringthe earliest stages oftheir galaxies' development, studying these objects could providesignificantinsights into how galaxies and their component stars evolve. Messier 107 is not visible to thenaked eye, but it can easilybe observed through binoculars or a small telescope from adark site. Theglobular cluster is found in the constellation of Ophiuchus, north ofthepincers of Scorpius. Roughly half of the known globularclusters in the Milky Wayhave been found in three constellations in the general direction of theMilkyWay's center: Sagittarius, Scorpius and Ophiuchus. Clusters in thisdirectionare the most likely to be spotted because they are all in elongatedorbitsaround the central region. Messier 107 was discovered by PierreM?chain in April 1782. Thirteenmonths later it was independently detected by William Herschel, who wasable toresolve the globular cluster into stars for the first time. But it wasnotuntil 1947 that this globular cluster finally took its place in Messier?scatalogue as M107, the most recent star cluster to be addedto this famouslist of bright objects in the night sky. The list was first compiled byFrenchastronomer Charles Messier in 1771. This image is composed from exposurestaken through theblue, green and near-infrared filters by the Wide Field Camera on theMPG/ESO2.2-meter telescope at La Silla Observatory.